My entire family saw Dr Kau and we were very happy. Currently, she only take care my husband, my youngest daughter and myself. She care about us. In the past she open her office on a Monday just to take care myself. I had a severe toothache. My husband mouth and teeth are very bad and she has done above and beyond to help him. Outstanding Doctor and smart ladies with her partner they have an excellent corporation. I'm a new patient with doc Kau. She is very knowledgeable and professional. She gave me all the info I need for my treatment and great advice on my further treatment. The staff are kind and very helpful. When I came in for additional fillings, she's very patient and did a very good job on my teeth cleaning and fillings. Highly recommend Santa Rita Family Dental and Doc Kau! I've been a client for more than 10 years. The Santa Rita Dental team is superb - consistent professional and quality service provided. Highly recommended! The whole fam have been coming here for years. We love Dr. Yee and the whole staff. Dr. Yee is very knowledgeable & friendly. We used to go to another dentist close to home but the kids would be crying their hearts out for a simple tooth filling but Dr. Yee and Femie was able to do a pulpotomy (baby root canal) with less drama. I personally am a wimp when it comes to dentists. But Dr. Yee can do any dental procedure on me with less pain than expected. We always leave with a smile plus goodies for the kids too! Excellent service and Dr Kau was very knowledgeable and experience.Thanks for helping with my dental emergency. She knew exactly the cause of the dental pain.Would highly recommend to others. I was referred to santa rita by by aunt to see Dr. Kau and i was very impressed by the facility and friendly staff which was very kind and courteous. I normaly don't like to go to dentist office because of the bad experience that i had with by previous dentist. But this experience was painless and with the hi tech equipment that they had they had me out less then an hour. I would highly recommend Dr. Kau. We LOVE Dr. Yee!! She is an amazing dentist. She explains any procedure that needs to be done. Very friendly and comfortable to be with. We live in Tracy and we don't mind traveling all the way to Pleasanton to see Dr. Yee because she is worth the drive. PLUS, they are open on Saturdays!! !The office is very clean. The staff are courteous and always smiling. You can tell that everyone there has great camaraderie. THANK YOU Santa Rita Family Dental Care!!! still great.New equipment. Never try to oversell. Perfect job and handle complicated procedures very easily.Really great doctors. Our favorite dentists ever!We've been going to see Dr. Yee and Dr. Kau since 2005. They are fantastic, caring and gentle with us and our sons. They are very knowledgeable, helpful, professional, kind ... you can't get any better ...The staff is great too. Kudos to Meghan, Florie, Anna and Femie :-)There's a treasure chest for kids, good magazines in the waiting area, comfortable chairs, and they'll change the TV channel if you ask.They went out of their way to help one of sons with a school report too. Wow! 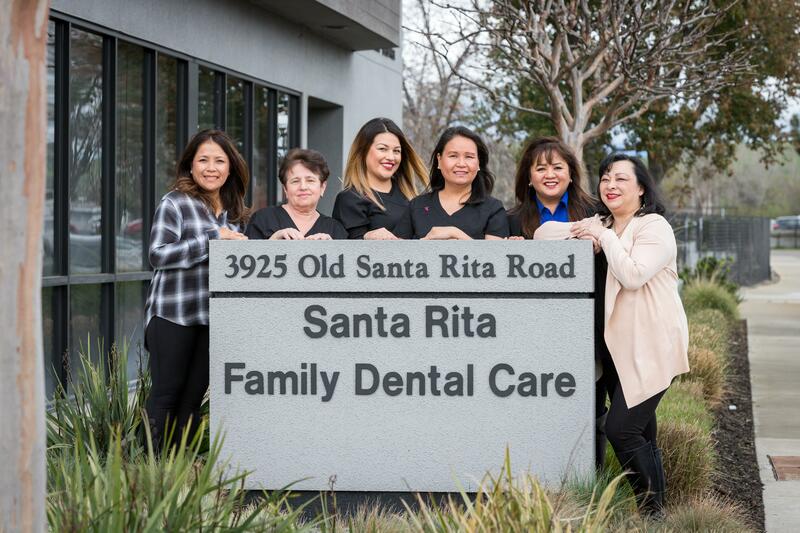 Santa Rita Dental, DDS (Family Dental Care) based out of Pleasanton, CA. Santa Rita Dental values your feedback and has received 10 reviews with an average rating of 5.0 from patients. Click on the Post Review button to share your comments.